Help! 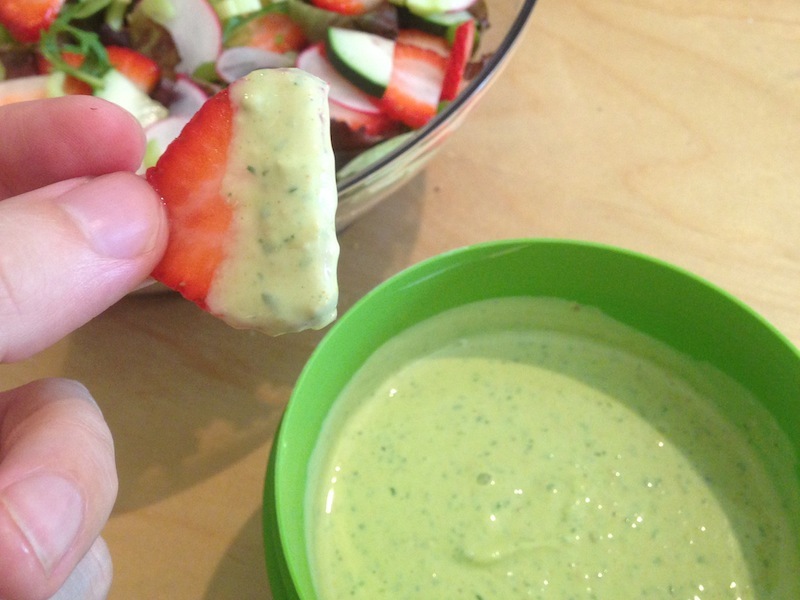 I Don’t Know What To Call This Awesome Salad Dressing | Keep It Up, David! You can call me a lot of things, but a lousy salad maker is not one of them. Check out this beauty! 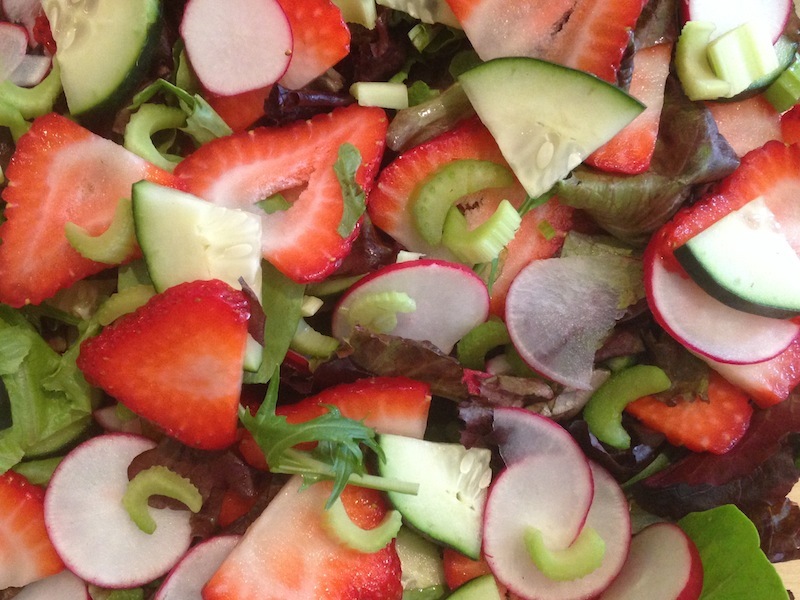 That’s spring mix as a base, topped with cucumber, strawberries, radish, and celery. I made a great big bowl of it and brought it along when I met up with my aunt and uncle and a couple of their friends for dinner. Does that sounds delicious? It is. 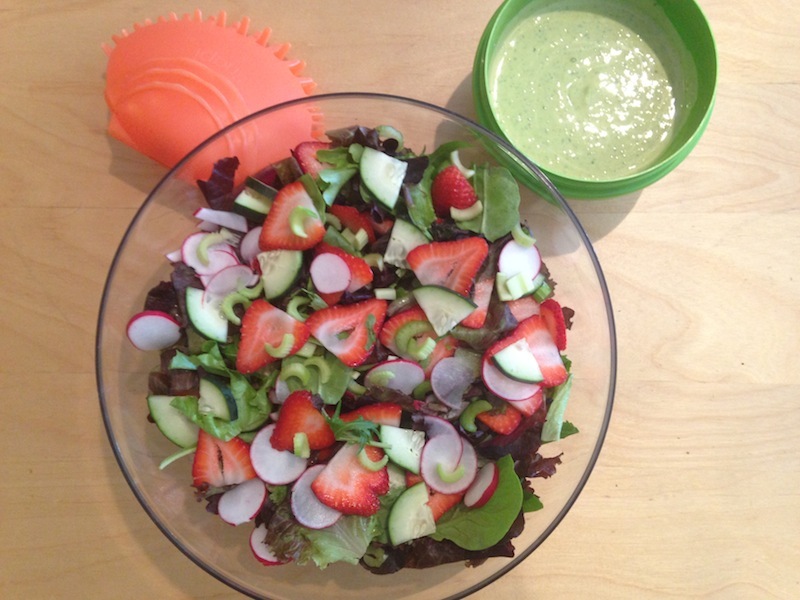 And the salad dressing I made for it, in the green bowl, seals the deal. It’s so good and complex that I haven’t yet come up with a fitting name for it. Maybe you can help! …but trust me, the end result is fantastic. 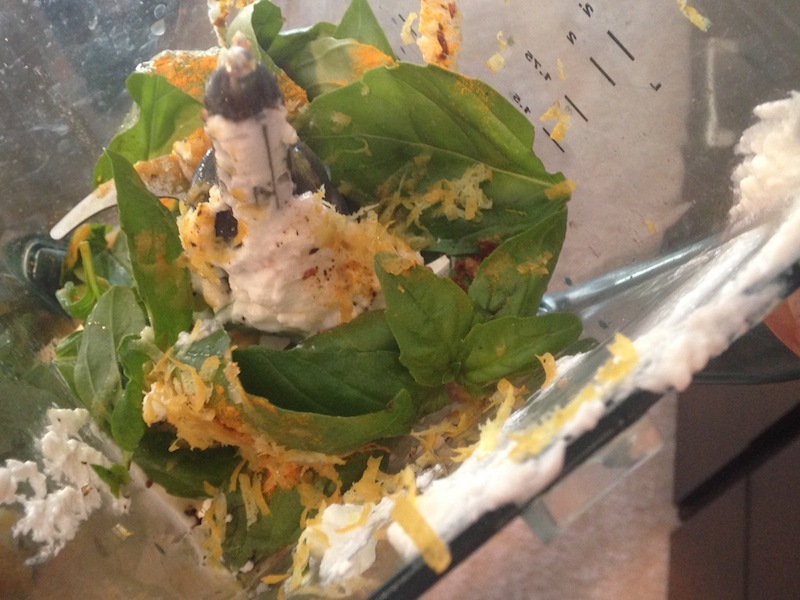 It’s creamy, and the basil and lemon make it bright and fresh. There’s tang from the vinegar and mustard, sweetness from the honey, and the slightest kick from the red pepper flakes. So many layers! If you have any ideas on what I should name it, share them in the comments section! Oh and FYI, this dressing is completely non-fat. You’re welcome. The salad used produce I picked up at the end of last week (see the end of my last post for photos of my haul). I also used a bunch of it in a stir-fry dish, but I only took one photo and now I don’t remember everything I put in it… so you’ll just have to enjoy that one photo and, I don’t know, shake your fist and curse my name? It’s Chinese eggplant, mini bell peppers, and a few other things with lots of garlic. 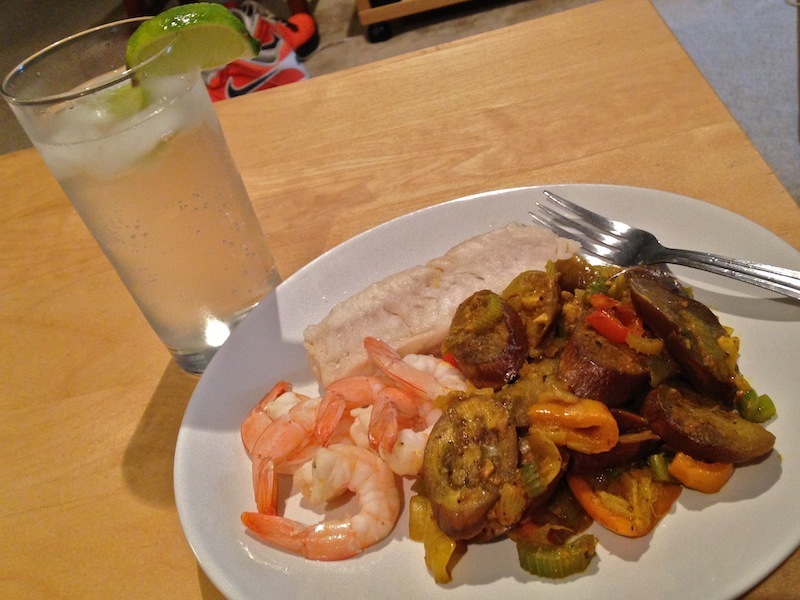 It was the side dish, and the main attraction was poached fish. I had some extra room in the poaching liquid, so I finished off a big Costco bag of frozen shrimp that had been in my freezer for a while. The garlicky veggies were delicious, but the real revelation from that night involved cocktail sauce. I had never made it before, and it’s so easy and so much better than the jarred stuff from the store! It’s just ketchup and prepared horseradish, in a roughly 3-1 ratio. I like it more tangy than sweet, so I used a little more horseradish. Some recipes online suggest you add dashes of lemon, Worchestershire sauce or hot sauce, but you really don’t have to. Time to buy more shrimp…so I can make more cocktail sauce! 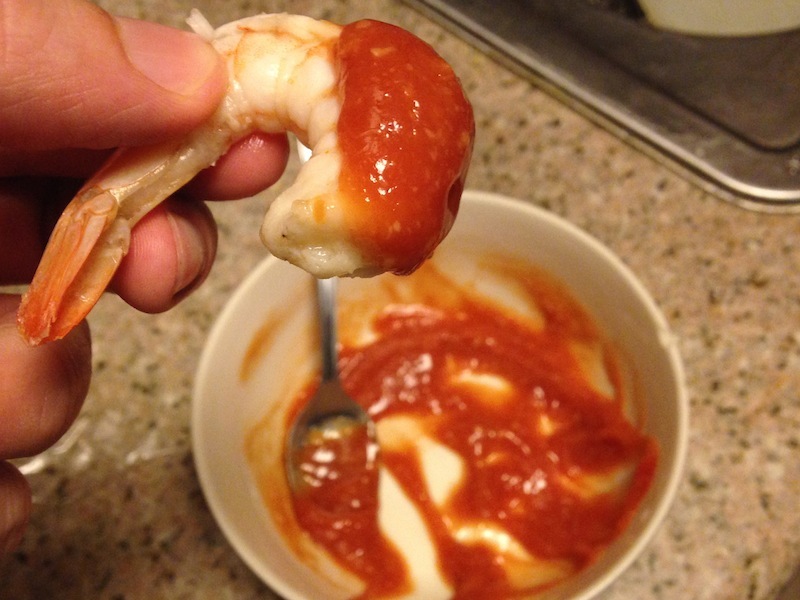 I’m so glad shrimp are packed with protein and low-cal and low-fat… because even though ketchup has sugar in it, shrimp cocktail is still a pretty guilt-free thing to munch on. This entry was posted on Tuesday, June 2nd, 2015 at 12:52 am and is filed under Uncategorized. You can follow any responses to this entry through the RSS 2.0 feed. You can leave a response, or trackback from your own site. Your readers will probably want to know what that cute clam “thingy” is in the picture as well. That’s what I thought, but so far, no one has asked! 🙂 I added that to the picture just for you, to see if you notice, and clearly you did! Bonus points! Yes, what is that cute clam thingy? David’s Delicious Dressing? So Good Salad Dressing? Verde Delicioso?